Lighting a Fire: I'm baaaaaaack!!! It feels so good to be home and I can't wait to sleep in- in my own bed tomorrow! I have learned SO much in the last five days. I can't believe how much information was packed into five short days! For those of you who don't know, I spent the last five days in Portland, OR studying with the brilliant Anita Archer and preparing myself to be a district trainer in Explicit Instruction (her new book). I will probably post a couple of things throughout the year- but I am technically not supposed to give away too much information- otherwise you wouldn't need a trainer! I did want to share some "Archerisms" right away and as I practice my own instructional skills throughout the year I am hoping to post with video and talk about all that I learned! Easy to remember classroom "Archerisms"
Regarding management: Avoid the void for they will fill it! That's it for now! 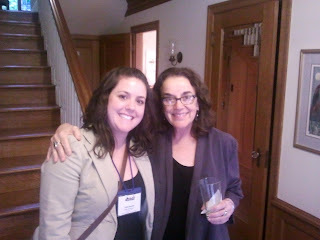 Here I am with Anita at her house for a cocktail reception. Some people think we look alike! I would love to be as knowledgeable as she is one day- I'm on my way! I love the Archerisms. I'll be looking forward to more in the near future! Welcome home. Sounds like fun! I've given you the Versatile Blogger Award. Come check it out! I love "avoid the void for they will fill it"! So, so true! !